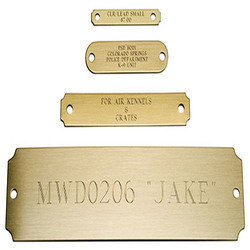 We are reputed as manufacturer and supplier of many sorts of Name Plates which are used to identify products. These are made from wood and plastic and top of the notch technology. Further, we are providing them in different sizes, shapes and specifications. We customize the products to suit clients’ needs and charge simple rates. Our professionals have enough market knowledge and offered ranges of custom name plates could be printed on aluminum with or without variable data. We always use high end techniques and the printing process could vary with regard to the requirements of clients’. We are offering these products in many sizes, shapes and decals and labels could be printed on substrates like polycarbonate, polyester and vinyl. 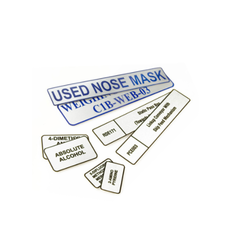 We are providing excellent varieties of info placards and polycarbonate labels for facilitating our clients. These polycarbonate labels are developed with the help of fine techniques and they usually have a high visual impact. Further, we are providing them in many sizes, impressive designs and colors. These are appreciated for their fine finish and are offered at customer centric rates.